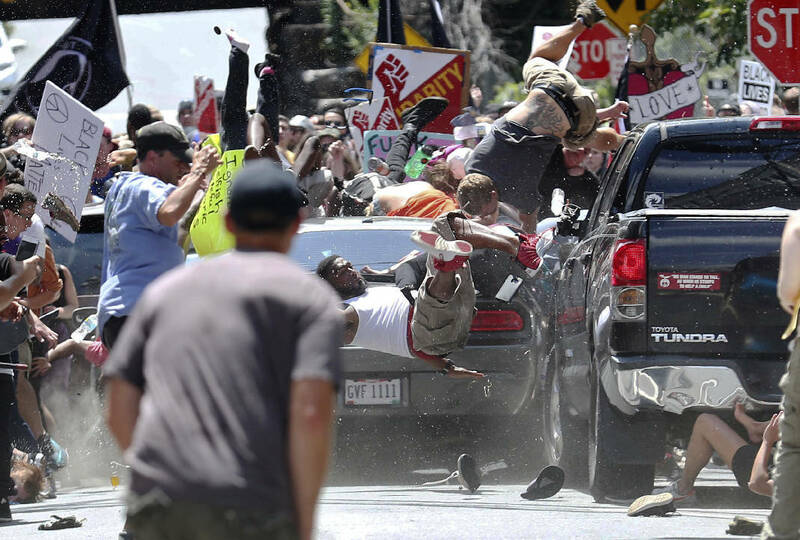 U.S. officials announce opening of civil rights investigation into vehicular death in Charlottesville. Charlottesville Police ID suspect authorities say plowed into a group of protesters as James Alex Fields Jr. of Ohio. Jason Kessler said in an interview Saturday evening that whoever drove a car into a group of counter-protesters "did the wrong thing." He said he was saddened that people were hurt. Kessler is a local blogger and activist who described the event as a pro-white rally. He planned it to protest the city's decision to remove a Confederate monument. He also criticized law enforcement's response to the event, which was dispersed before speakers could take the stage. The mayor of Charlottesville said via Twitter on Saturday that he is "heartbroken" to announce that a "life has been lost." He did not provide details. Nigro says it was "chaos and mayhem" as bodies flew. Officials didn't immediately release any further information and it wasn't immediately clear if anyone was in custody. Trump tweeted Saturday that "we ALL must be united & condemn all that hate stands for." He then wrote "There is no place for this kind of violence in America. Lets come together as one!" Some of the white nationalists cited Trump's victory as validation for their beliefs. Right-wing blogger Jason Kessler organized Saturday's rally to protest the city's decision to remove a statue of confederate General Robert E. Lee. Richard Spencer is a prominent alt-right activist who was scheduled to speak. He says he's also encouraging people to go home. Trump said Saturday on Twitter: "Our country encourages freedom of speech, but let's communicate w/o hate in our hearts. No good comes from violence." It's the latest confrontation in the city since it voted to remove a statue of Confederate Gen. Robert E. Lee from a downtown park. The NHL's Detroit Red Wings released a statement denouncing the use of their logo at the white nationalist rally in Charlottesville, Virginia, and saying they are considering legal action to stop it. The team says it "vehemently" disagrees with and is not associated with the event. The Red Wings add they are "exploring every possible legal action as it pertains to the misuse of our logo in this disturbing demonstration." A Michigan-based white nationalist group called the Detroit Right Wings uses the Red Wings' logo. The organization posted on its Twitter account that members had arrived in Charlottesville. Virginia's governor has declared a state of emergency in response to a white nationalist rally that is expected to draw up to 6,000 people. Hundreds of people are facing off in Charlottesville ahead of a white nationalist rally planned in the Virginia city's downtown.